It's-a me, kid with a backpack! Nostalgia is big business. And honestly, I don't mind. A lot of indie studios are forging new territory by jumping back a few decades in their game design aesthetics, creating throwback titles that tug at the heartstrings by reminding us of the days of old. PolyKid's 3D platformer Poi is just such a game. 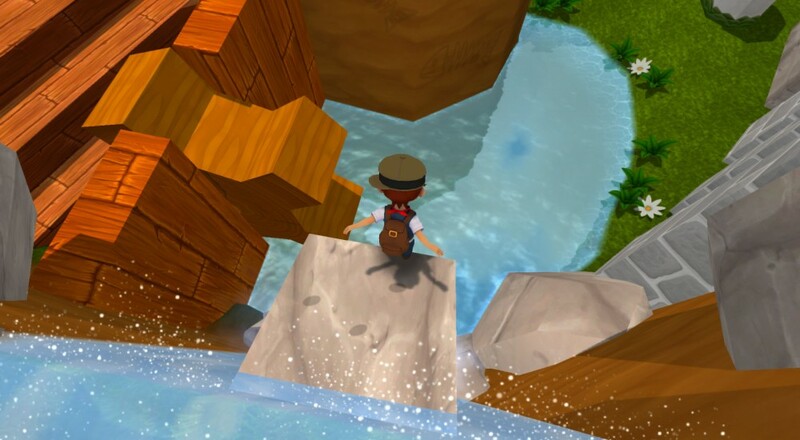 The idea behind Poi is that 3D platformers are really fun and we should still play the heck out of them. Remember how awesome Banjo-Kazooie was? And Super Mario 64? And, unless you're one of those people that couldn't stand the bright happiness despite the amazing level design, Super Mario Sunshine? PolyKid likes those, too, and Poi looks to recapture the feeling of exploring a colorful world by running, jumping, bouncing, flipping, climbing, sliding, swimming and exploring all day long. One of the neatest things about Poi is that it's being built with co-op play in mind. Not a lot of details have been released so far, but early footage shows two non-local players running around, chasing foxes and picking up keys together. The actual interactive and cooperative aspects look fairly minimal, but it's early alpha at best, so who knows what will end up in the final release. So, the bad news is Poi's crowdfunding campaign didn't meet its goal in time. Co-op was technically one of the stretch goals, but the team has footage of rudimentary multiplayer running, so it's apparently still part of the plan. The good news is PolyKid is still planning to continue development. At the moment, the intended release platforms are PC and Wii U. Poi has already been Greenlit on Steam, so now it's just a matter of sitting around, wondering where that Super Mario 64 cartridge is and if the N64 is too caked in dust to actually work. Page created in 1.7839 seconds.